Synthetic mesh strainers, metal bucket screen grid, bucket grids, cone shaped mesh strainers, elastic top mesh strainers. Trays, liners and buckets are available on the Paint trays page. Lint free. Guaranteed no loose fibers or threads. Holds up better than cotton with less fibers in the mix. Gerson media is custom-woven to provide precise and uniform pore size for best filtration. Designed for basecoat and clearcoat finishes, but provides superior straining for all paints, including waterborne. Quicker filtering times reduce waiting time. Sold by the sleeve, 250/sleeve, 4 sleeves/box. 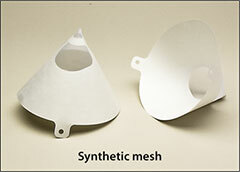 Regular mesh elastic top bag strainers for 1 and 5 gallon containers. Double stitched edges and polyester mesh. Perfect for straining all types of paints, stains and liquids. 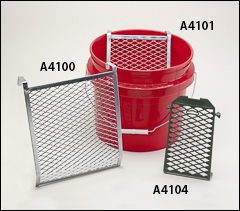 Bag strainers remove dried flakes, lumps, filaments and other dust particles from paint. Also available in a 2 gallon size and in fine mesh. Sold by the box, 25/box. Plastic grid can be used in 1 gallon can. Made with durable polypropylene that resists solvents and won't rust. Hooks secure grip in place. 9" x 5 1/4". Sold by the box, 12/box. Metal grids can be used in 2 and 5 gallon buckets. Expanded wire and reinforced on all four sides. A4101 is 9" x 7 1/2". A4100 is 10" x 12". Sold by the box, 24/box.